Bill Hayes’s critically acclaimed memoir Insomniac City provided a first look at his unique street photography. Now he presents an exquisite collection that captures the full range of his work and the magic of chance encounters in New York City. Hayes’s “frank, beautiful, bewitching” street photographs “unmask their subjects’ best and truest selves” (Jennifer Senior, New York Times): A policeman pauses at the end of a day. Cooks sneak in cigarette breaks. A pair of movers plays cards on the back of a truck. Friends claim the sidewalk. Lovers embrace. A flame-haired girl gazes mysteriously into the lens. And park benches provide a setting for a couple of hunks, a mom and her baby, a stylish nonagenarian . . . 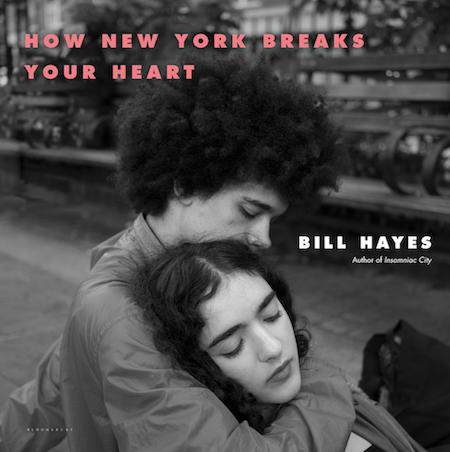 There is something very special about New York that Bill Hayes wants to share with us in How New York Breaks Your Heart. Readers get to see the snapshots of the different people you encounter in New York—ladies sitting on the sidewalk smoking cigarettes, couples/friends/family with arms wrapped around each other, people lounging on benches, workers on their breaks, and on. Some with smiles, others with forlorn or meditative expressions. It’s a diverse group of people that you’d find everywhere you walk in New York. The beauty is in the people you find. You can’t help but fall in love with this New York like Bill Hayes writes. These photos aren’t accompanied with a lot of the text, so you, as the reader, interpret the photos however you want. I read How New York Breaks Your Heart as an ARC with grayscale photos, and I’m interested to see how my experience of the book changes by seeing all the photos in high quality with color. How New York Breaks Your Heart is a beautiful collection of photos featuring the beautiful people of New York and how we can fall in love. Are you familiar with Bill Hayes’s work?